By Terry Dunn on Sept. 28, 2016 at 8 a.m.
After years of improvising with cardboard boxes, beach towels, or whatever else I happened to have on hand, I finally decided to build a proper landing pad. Many of the sites I use for multi-rotor flying have very rough ground. This sometimes makes it tough to find a suitable spot for launching and landing. Even if I do uncover a patch of level ground, I'm sure to kick up a cloud of dusty West Texas topsoil as soon as the props start spinning. After years of improvising with cardboard boxes, beach towels, or whatever else I happened to have on hand, I finally decided to build a proper landing pad. I looked for commercial options before deciding to build my own pad. There are numerous landing pads on the market, but none seem to fit my needs. First of all, most of them are smaller than I wanted. If I used a circular pad of just 16" (406mm) or 20" (508mm) diameter I would still create dust storms when I flew my larger ships. It also seems that most of the commercial offerings are not rigid. This would not help me deal with rough, uneven ground. Once I had decided to build my own landing pad, I considered what material options I had available. I didn't really want to use any type of wood because I felt that the pad should be totally weatherproof. The solution presented itself during a recent trip to my local Tractor Supply Company store. 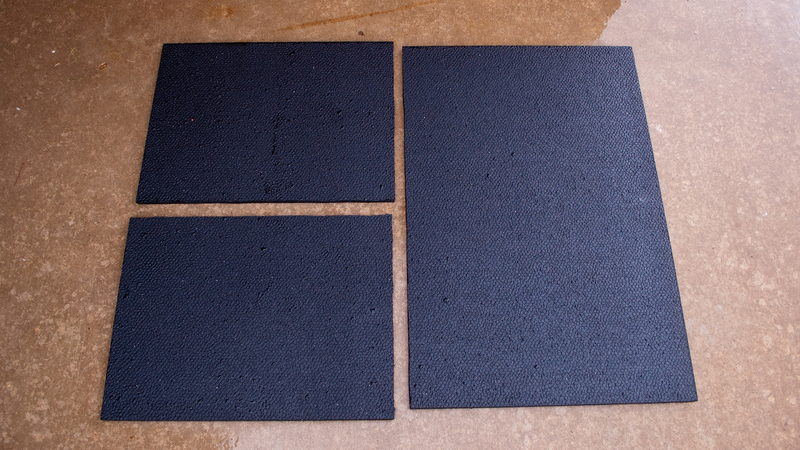 One of the sale items stacked out front was a .5" (13mm)-thick rubber mat measuring 4' (1219mm) by 3' (914mm). I didn't want a pad quite that big, but I figured I could cut it down to the size I needed. For only $20, it was worth a shot. The raw 4' x 3' rubber mat was larger than I needed and weighed almost 40 pounds. I cut it into three smaller sections using a utility knife. When I picked up the mat, I wasn't quite ready for its nearly 40-pound weight. This is a substantial piece of recycled rubber! I just hoped that it wouldn't be too heavy to handle once I had cut it to size. Once I got the mat home, I decided that I could make three separate landing pads with it. I made one larger pad measuring 3' (914mm) by 2' (610mm), and two 2' (610mm) by 1.5' (457mm) pads. The large pad would be useful for my 350mm-class and larger multi-rotors at particularly rough sites. 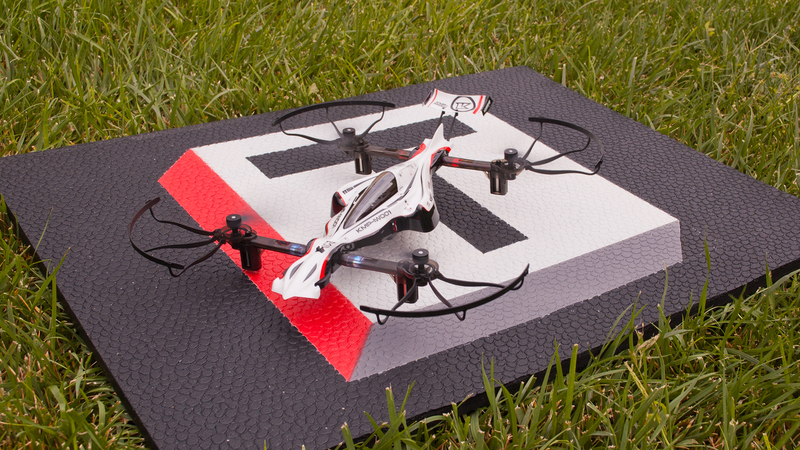 The small pads were intended for my racing quads, or even the larger ships when I fly from relatively smooth areas. I made the two cuts using a regular utility knife. It took numerous swipes of the blade to cut all the way through the thick rubber, but it was not difficult to do. If you're a minimalist, you could actually be done with the project at this point. Turning a big mat into little mats is not very challenging or time consuming. I decided, however, that I wanted to personalize my new landing pads. Like most people, I have a selection of spray paint on the shelf in my garage. I considered using some of these to spice up my landing pads, but I didn't think that the results would be permanent. My previous experience with painting flexible things has been that the paint flakes off all too soon. 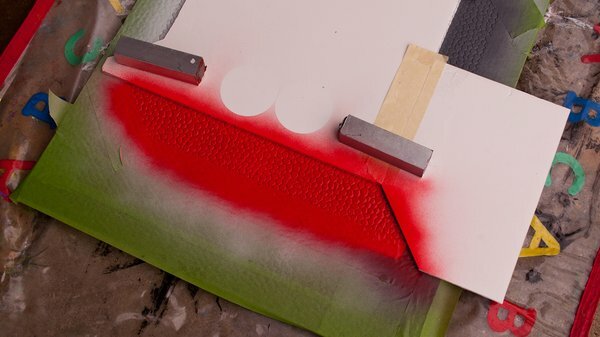 Then I discovered that there are rubberized spray paints made just for coating flexible materials (among other things). 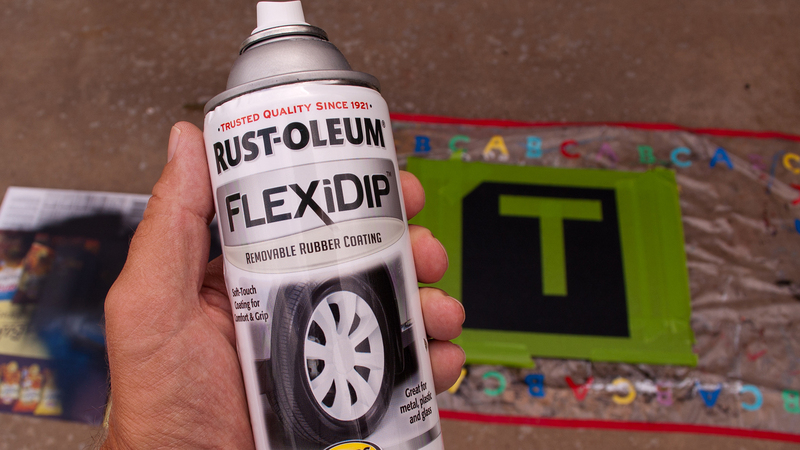 I went to Home Depot and picked up three cans of Rust-Oleum FlexiDip paint. 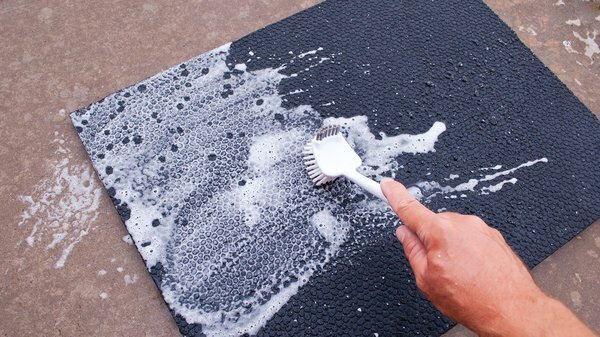 Before decorating the pad, I cleaned it with dish soap and a brush. To prep the pads for painting, I first scrubbed them with a brush and dish soap. Once they were dry, I began masking off my design using 2" (51mm)-wide FrogTape. 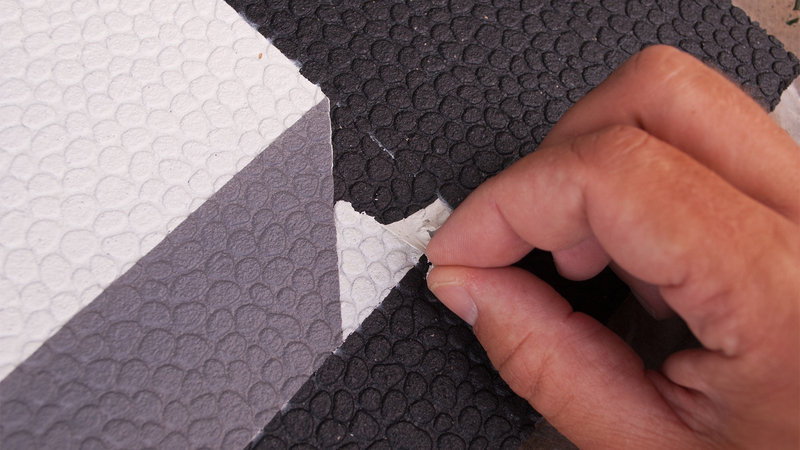 The top side of the rubber material has a significant texture to it. So, I knew that I would not be able to get a very good edge seal with the tape. I just hoped that the paint was thick enough that it wouldn't bleed under the tape too badly and make the painted lines fuzzy. 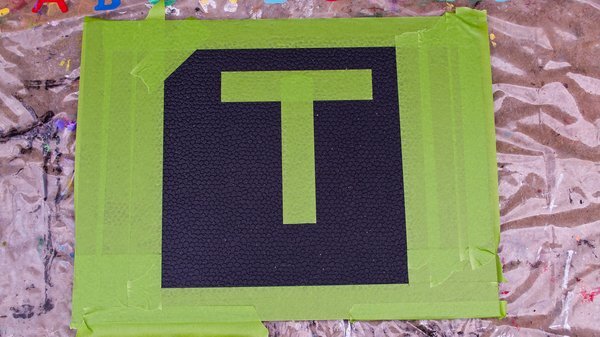 I used FrogTape to mask the pad. The paint bled in some areas due to the heavy surface texture of the rubber. I chose white, red, and grey paints. I was a little concerned that the red would not cover the black rubber very well. To mitigate this, I first painted the entire area with a few coats of white. This later served as an undercoat for the spots that were subsequently painted red and grey. In order to preserve the white areas that were to stay white, I made simple masks using foamboard. A rubberized paint like FlexiDip is ideal for use on flexible materials. Standard paints will likely flake off. Not long after I had started applying the white base coat, I realized that I had masked one of the corners incorrectly. There was already paint in an area that should have been masked, but it wasn't an issue. One of the features of this paint is that it can be pulled off once it is dry. After I had finished painting. I cut the corner border to the shape it should have been and peeled away the excess paint. It didn't come off in a single sheet, but it was a rather easy job. I made foamboard masks to protect the white areas while applying red and grey. I followed the directions on the paint can and I was very happy with the results. The texture of the painted areas is consistent with that of the unpainted parts. When I was removing the masking tape, some areas of paint didn't separate from the tape. To remedy this, I ran an X-Acto blade along each of the paint borders before pulling up the tape. The painted borders are not as crisp as I wanted, but they're acceptable. I may use a liquid mask for the next pad so that the surface texture is not a hurdle. Dry FlexiDip can be peeled away from the surface. This property allowed me to correct a masking error. I have only painted one of the pads so far, but I have decorative plans for the other two. I've used both sizes of pads at different locations and they are working as expected. The larger pad weighs nearly 20 pounds, but it isn't difficult to manage. In fact, the heaviness of the pad helps it to lay flat on tall grass. It is a nice coincidence that the larger pad fits well in the rear compartment of my van. That's where I store the pad to ensure that I never forget it. It also serves as a handy anti-slip surface when I'm hauling other things back there. 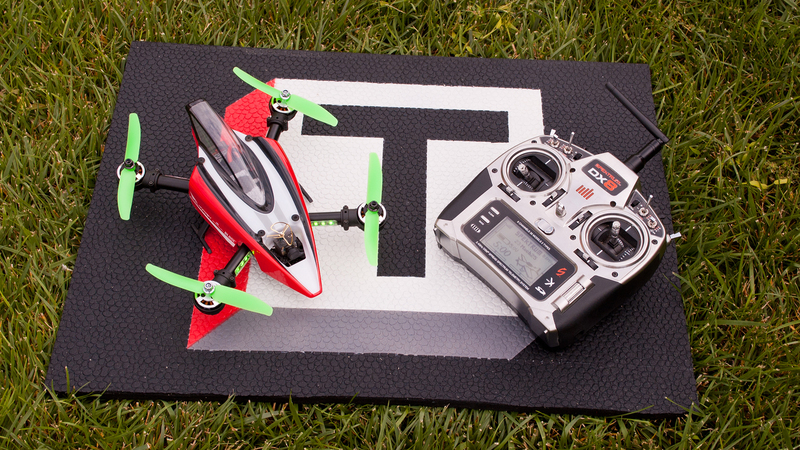 The smaller pads are perfect for use with quad-racers. If you're like me and have a tough time locating good launch and landing spots for your multi-rotors, a landing pad should do the trick. As with so many other things, taking the DIY approach here is easy, inexpensive, and more personalized than any off-the-shelf option. Terry is a freelance writer living in Lubbock, Texas. Visit his website at TerryDunn.org and follow him on Twitter and Facebook. 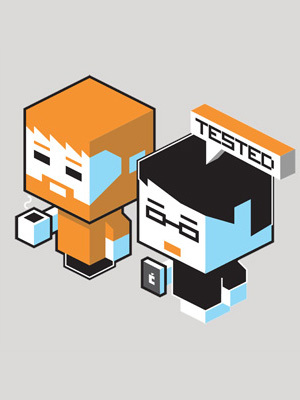 You can also hear Terry talk about RC hobbies as one of the hosts of the RC Roundtable podcast.